For more information about Greater Spokane County Meals on Wheels or the 13 Silver Café locations go to www.GSCMealsOnWheels.org or call (509)924-6976. GSC Meals on Wheels is always looking for volunteers, especially route drivers and substitutes. Need catering? Silver Café Catering raises money for the home-delivered meal program by custom catering for event small and large. The kitchen is also available to rent. For catering information, call (509) 230-4311. When it comes to preventing illness and chronic disease, keeping people out of the hospital and making quicker recoveries, access to good nutrition is a component that can be overlooked. 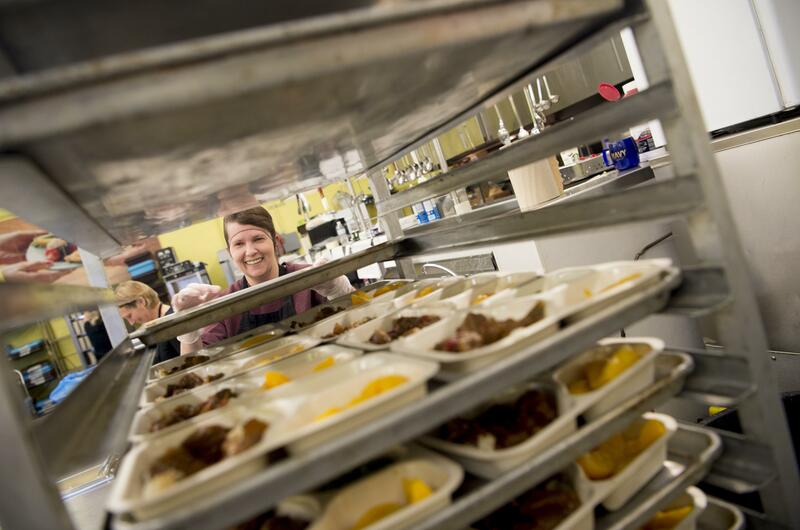 Greater Spokane County Meals on Wheels is part of a national push to integrate nutrition into America’s health care system, making food a medical intervention just as acceptable as medication. Greater Spokane County Meals on Wheels, which will serve 275,000 meals to seniors and people with disabilities across Spokane County this year, is working with seven other community nutrition organizations across the nation to figure out how to integrate nutrition services into the mainstream health care system. That means changing the way people – especially doctors, hospitals, insurers and other providers – view community nutrition services such as Meals on Wheels. It’s more than a nice group of volunteers delivering a hot dish of turkey divan to the doorstep. Nonprofits like Meals on Wheels view themselves as a hidden specialty, experts in nutrition services that must contract with managed care and accountable care organizations to help screen for and reduce malnutrition. “We need to be partners in care,” said Pam Almeida, executive director of Greater Spokane County Meals on Wheels, adding that hunger and nutrition intervention need to be viewed as a health care issue. The cost of senior hunger to the U.S. health care system is staggering: one in three seniors are malnourished when admitted to the hospital and overall one in six seniors face hunger. Disease-associated malnutrition costs the country $157 billion each year, according to a 2014 study in the Journal of Parenteral and Enteral Nutrition. Other research shows a 300 percent increase in health care costs attributed to patients’ poor nutrition. In Washington, 178,063 seniors are threatened by hunger and 319,873 have difficulty paying for basic living needs. The $10,000 grant by the National Center on Nutrition and Aging, which is hosted by Meals on Wheels of America and the Administration on Aging, focuses on business acumen, teaching nonprofits how to talk with and eventually partner with medical providers that haven’t yet embraced the idea. The goal, especially with the tidal wave of baby boomers and the shifting landscape of health care, is to keep people at home and healthy and ultimately reduce health care costs. Christine Fraijo, 62, knows Meals on Wheels keeps her healthy – with cancer and hepatitis C she’s not strong enough to cook and standing for long is difficult. Almeida estimates her kitchen and staff could provide three meals a day and frozen meals for the weekends to 100 people recently released from the hospital and in care-transition programs. That’s in addition to the traditional 25,000 home-delivered meals and those at the 13 Silver Cafes each month. They would need more staff to do more than 100 extra transition care meals. Last month, as an in-house experiment, Meals on Wheels delivered one hot lunch and enough food for a dinner and breakfast to 10 patients recently released from the hospital and participating in the Bridging Care Across the Northwest program that recently ended. It was a success in Almeida’s mind. She knows it can work. Now she just needs to get a contract with local medical providers who are willing to incorporate nutrition services into their treatment plans. Almeida is also working with Washington State University nutrition students who are developing a community-based nutrition assessment that meal deliverers could give to clients to see if they are in danger of malnutrition. The results could tell Meals on Wheels if its interventions are working. Almeida said that’s important to get buy-in from the medical community. Meals on Wheels is an untraditional partner, said Ucheoma Akobundu, director of project management and impact for the National Center on Nutrition and Aging. But it is trusted by clients and by communities. Hospitals and doctors aren’t skilled at working with people once they get home from the hospital or even before they are admitted for a routine surgery such as a hip replacement. Providers don’t usually screen for malnutrition. She said nutrition programs can use that leverage to get hospitals and other providers to see nutrition as an important part of transition care programs. Nationally, one in every five Medicare patients sent to the hospital ends up returning within a month. About 2.6 million seniors are readmitted to the hospital within 30 days of their initial stay, costing $26 billion every year, according to the Centers for Medicare and Medicaid Services. Nutritious meals could help reduce hospital readmission rates and save money. Almeida said it’s working in California, yet Washington is behind. It has a state rule that reduces in-home care hours if meals are provided. “It really reduces the pool of people we are able to work with,” said Lynn Kimball, the executive director of Aging and Long Term Care of Eastern Washington, which distributes federal money to Greater Spokane County Meals on Wheels. The aging organization has started its own local coalition, Conexus Health Resources, which includes Meals on Wheels, Rural Resources Community Action and the Spokane Center for Independent Living, to look at ways to collaborate their community care services with more traditional medical health care services. The idea compliments Almeida’s work with the National Center on Nutrition and Aging. She said the collaborations are working with area aging agencies in other states. Local talks are just beginning and Kimball wasn’t ready to disclose any medical contacts. Published: March 20, 2016, 4 a.m.